Kicking off my series of Thanksgiving recipes with a the perfect festive fall cocktail, Pear Royale. 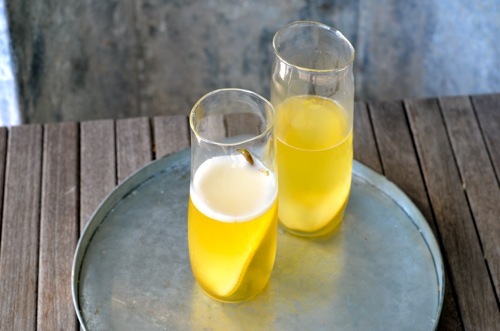 Easy to make with pear simple syrup and your favorite champagne! Follow along all month as I share recipes to make a delicious Thanksgiving feast! From by the bay, wishing you bubbly food memories! In a champagne flute add the pear simple syrup, top with champagne. Peel, core and cube pears. Place in a medium saucepan with water and sugar. Bring to a boil and simmer for 20 minutes. Use a potato masher to mash pear. Use a fine mesh sieve to strain mixture pressing the liquid through with a back of a spoon and cool. Keep in the refrigerator until ready to use. Keeps for a week. This entry was posted in drinks and tagged champagne cocktails, champagne recipes, cooking with pears, pear royale, simply syrup, Thanksgiving recipes on November 10, 2015 by entertainingbythebay.